Vineyard favorite, Bill Benson is BACK! 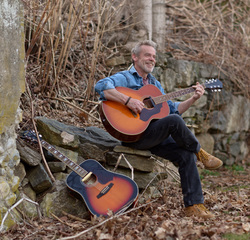 Connecticut based singer-songwriter Bill Benson, who performs music as a messenger of love, hope and passion. He conveys his messages through inspiring lyrics and heart-felt vocals in the styles of folk, country and soft rock. Bill leverages the deep, brassy timbre of his vocals to convey emotion and draw listeners into his songs, evoking a mood that pulls you into the moment and offers retreat from life’s day to day chaos. Bill is host and producer of the Nutmeg TV cable show ‘Porch Time with Bill Benson’ - spotlighting singer/songwriters from around the state, sitting on the porch talking music, songs and inspirations. Bill is currently working on the follow up to his 2015 CD ‘This Old House’, titled, ‘Come A Little Closer’ expected to be released late in March 2018.